Nassau County Executive Laura Curran wants to borrow $100 million in 2018, and $200 million more next year to pay down a $360 million backlog of property tax refunds. Nassau County legislators Monday approved County Executive Laura Curran's request to borrow more than $100 million this year to help pay down a $360 million backlog of property tax refunds. Curran, a Democrat, has said she wants to borrow $100 million in 2018 and $200 million more next year to wipe out a large portion of the debt that has piled up in recent years and is accruing interest. 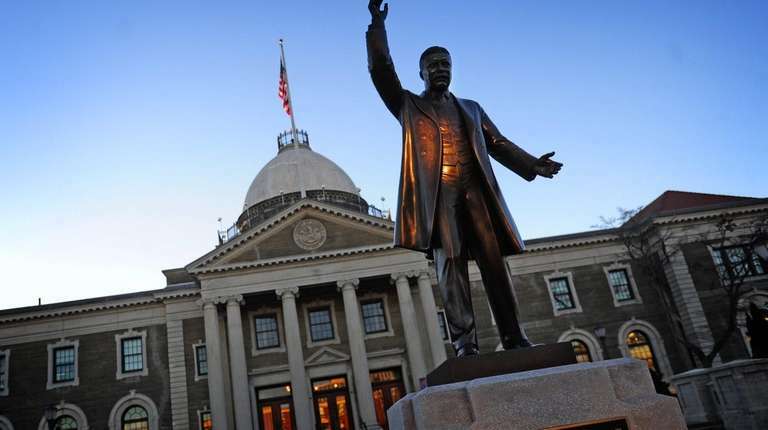 Legislators had tabled the proposal earlier in the afternoon, saying they wanted assurances from the Nassau Interim Finance Authority, which controls Nassau's finances, that it would ultimately approve the borrowing. But several hours later, after lawmakers had convened in private, Presiding Officer Richard Nicolello (R-New Hyde Park) said he had received assurances from NIFA officials that the board was open to Curran's proposal and that there were enough votes to approve it. "There are many businesses, many commercial entities, many small businesses that have been owed this money," Nicolello said. "We need to pay back the refunds of those that are owed those monies." NIFA generally has opposed borrowing for legal judgments, severance pay and other claims board members say should be paid with operating funds. Nicolello had said earlier Monday, "We need some direction from NIFA that they've changed their direction." In a statement, NIFA spokesman David Chauvin said the control board, "has a longstanding policy of not considering any actions until the legislature has acted and items have gone through the entire legislative process." Nassau legislators on Monday also approved spending of $200,000 to send tax notices to residents disclosing the potential impact of reassessment on tax bills. The bills are expected to be mailed by Dec. 1. Republican lawmakers had accused the Curran administration of deception for detailing in the notices what tax bills would look life if state lawmakers were to approve a five-year phase-in of changes in market values. The administration is hoping state lawmakers approve legislation to allow Nassau to gradually increase or decrease a homeowner's market value to prevent swings in tax bills. "The reason that this whole dance is going [on] is the administration knows that those people are going to be very angry," Nicolello said. He said the state legislation does not exist and said the administration "should have the courage to be frank with people." By including the phase-in in the tax notices, "you could be deceiving the entire populace of the county, because if the phase-in never happens, people could be reassured or lulled into a sense of security that, no, these tax increases are not coming all at once, and then they will," said Nicolello. Curran aides said they were confident the state Legislature would approve the legislation. Mike Murphy, a spokesman for Senate Democrats, who will take control of the chamber in January, said his members were still reviewing the plan. Curran warned about Nassau reassessment planNassau's new assessor warned the county executive that Nassau could face up to $200 million in tax refunds if Curran sticks with her reassessment plan. Curran wants to borrow $300M for settlementsNassau County officials are seeking approval to borrow $300 million to pay down a $360 million backlog of tax refunds.